Leaders, recognize employees for their individual strengths and talents and you spark employee engagement. Plenty of studies support this claim. Plenty of leaders think this means company recognition programs, awards, and celebratory events. That’s nice yet nothing sparks other human souls like sincere appreciation of their unique strengths. Let your people skills shine and applaud the employees’ natural talents with worthy kudos. No matter the age, the gender, the occupation, or the title, the employees connect with the future when you spotlight their present strengths. As you read through this list, think of the potential joy, energy, and engagement these kudos can spark. Organized without being rigid. In this day of do more with less, information overload, and enterprise integration of everything, organized people who can flex and adapt are a treasure to any business. Tell them. Applaud it! Thirsty for knowledge and application. Business is moving fast and furious to fulfill the present and create the future. Employees who are constantly learning and applying it are both the fuel and the ballast for success. There’s a worthy kudo! Sensing potential and spotting futility. Employees who can accurately sense when to advance an initiative and when to recommend scrubbing it propel the organization forward and prevent it from falling. Laud this worthy talent. Tough, thorough, and reliable. How often do you overlook those that you can totally depend on? Change it. Tell them how much you truly appreciate their constancy and commitment. Intuitively strong. Today’s focus on data sometimes minimizes those who use their intuition for everyone’s benefit. They move highly data driven people from stagnation to appropriate risk taking. Applaud their worthy insight. Analytic and creative. These two talents are often thought of as mutually exclusive. They aren’t. There are employees who can create ideas and analyze to implement it. These dual talents also serve well to bring teams together for project success. How about another round of applause here! Passionate and restrained. Passion is inspiration that renews itself and energizes others. It takes passion to ignite success and restraint to stay on course. Employees who contribute both make your job as leader easier. Worthy of applause and gratitude! Positive and realistic. A positive attitude sustains everyone and realism sharpens the vision and prevents being blind sided. Successful entrepreneurs have and value it. If your employees have this, it’s worthy of a compliment! Grateful. Employees who live their lives with gratitude often minimize workplace drama. Their inner sense of happiness and control filters noise instead of reacting to it. They aren’t doormats yet they easily see what truly matters and let the rest of the baloney fall away. They bring balance to new teams. Offer gratitude for their gratefulness! Remarkable in people skills. Great people skills are the daily life blood of an organization. Interacting skillfully with each other, with customers, suppliers, regulators, auditors, and the media in a multitude of settings delivers success to the business. Don’t drain the lifeblood by ignoring it. Replenish it with an occasional remark of worthy appreciation. Resourceful. Employees that shine in creative problem solving convert obstacles into pathways of success. Who in your organization is highly resourceful? Tell them how it makes a difference! Confident. Distinctly different from arrogance, confidence delivers great presentations, strength in new challenges, accountability for results, and willing ownership of mistakes. Show your appreciation for this maturity. It’s worthy of it. Noticing and applauding employees’ talents and strengths sparks joy and engagement. Who wouldn’t want to commit when they see and hear their value? Sales teams get to see it in money. Show it to non-sales teams in your reflection, remarks of appreciation and worthy kudos. It’s a no cost and high return investment! I welcome your additions to this list. What other employee talents and strengths have you applauded? Kate Nasser, The People Skills Coach™, delivers coaching, consulting, training, and keynotes on customer service & experience, teamwork, and leading change. Kate turns interaction obstacles into business success. See this site for workshop outlines, keynote footage, and customer results. We all get caught up in the busyness of work and forget to applaud and celebrate those who help us get it all done. There is nothing more rewarding than employees that help keep the drama down so that we can all be more productive. We have to remove the distance between leaders and employees to be able to recognize the worthy traits that you have listed. We keep our distance when we want them to be imoressed by us. We have to get close to them for them to influence our lives and vice versa. We have to walk in their shoes and know a little about their personality to sense their levels frustrations and desires to move ahead. This takes commitment to relationship. And relationship requires some level of intimacy. But it is through these relationships that we build better, happier and healthier teams, and better businesses. This is so important! It is essential to give the recognition boost by “sparking” team members to see the different ways they are making solid contributions. The “sparks” need to be well-meant, real. Sometimes, leaders will say something positive about just the “smaller” things and ignore making the substantial heart-felt kudo on the bigger milestones. I guess the point may be to take the smaller steps, which may lead to the bigger steps. All in all, though, make the “kudos” real and meaningfully said. Compassionate – Both with customers and co-workers. In the health care field, especially, even programmers and IT staff encounter and influence life-changing events daily. Taking the time to acknowledge the existence of human frailty, be compassionate and demonstrate that with a few kind words/actions adds to the effectiveness of what’s in the formal job-description (the “real” work). A very nice post with a great message to employers. 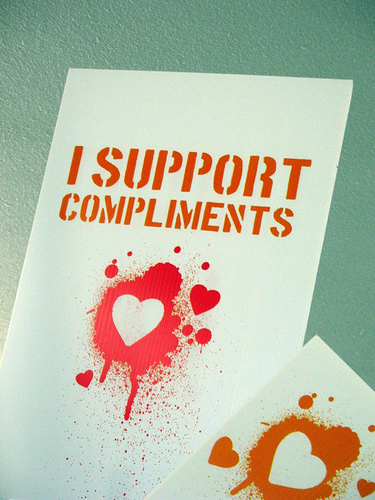 Compliments and At-A-Boys/Girls are so important and don’t cost the organization a thing except a few minutes to make someone’s day. Study after study has shown that money is not the number one motivator for employee engagement. Workplace relationships with a supervisor and co-workers consistently ranks high as does growth/learning opportunities, and meaningful work and feeling like a contributor. When employees work in an enviroment of mutual respect, productivity goes up and this is a win-win for everyone. Thank you for indentifying 12 excellent qualities in employees and encouraging managers to recognize them! So often manager focus on recognizing results and forget to recognize the underlying skills that lead to results. Encouraging employees, even encouraging oursevles, is important to engagement, motivation & success. I would invite anyone reading this to give themselves a pat on the back if they practice any of these great qualities! Kate — As always, a smart, useful, specific post. The very best boss and mentor I ever had in my life was an expert at seeing and applauding the specific strengths of individuals. In fact, he could positively see more in people than they often could see in themselves, and in areas where he himself was less strong. With the reliable, devoted person he praised reliability. With the person who had encyclopedic knowledge, he praised the value of the person’s understanding. With the creative individual, there was recognition for the next cool thing that got created. All of this praise was for gifts that directly related to the mission of the department and how we operated together as a team. He was not afraid to — in his words — help others stand on his shoulders to exercise these gifts and individual capabilities. It is an art to express such things to others in a genuine, not instrumental or manipulative way. His way of “seeing” others wasn’t to get something in return, such as improved morale or more energy or engagement or productivity. It wasn’t to “motivate” other people. He said it because he really felt it. That simple. And you can bet that that simple motivation of his, to express something he felt, indeed created an environment in which people felt released into their own best capabilities and biggest selves — and then they would do almost anything to bring that big self forward in support of the common cause. Thanks for this Kate. Really resonates with the qualities to look for and to work at drawing out individually and collectively. Evolutionary culture change requires present-moment awareness combined with alignment of the individual’s passions/pursuits with those of the organization/collective. It is my experience that when this alignment is present AND employees are valued for this alignment, high engagement results. Kate, Excellent post and terrific list. There are some pre-requisites for leaders to be able to follow your on-target advice. 1. Must be aware of what these behaviors look like and recognize them when they see them. 2. Acknowledge that taking time for such kudos is a worthy investment of work time. 3. Recognize that one of the deepest needs of any human being is to feel appreciated and valued. Those who are skilled at giving praise in a genuine way understand this. 4. Have a healthy level of self-esteem so they don’t feel they’re taking something away from themselves by recognizing another’s strengths. Bingo – and spot on Meredith. Thanks for expanding the discussion in that way. Kate, what a great list of things to look for to build employees and relationships. I’m sure that everyone reading this, can appreciate how each trait makes work and life better, so thanks for helping us recognize them more easily. Teams can function so more effectively when everyone recognizes with appreciation, the special skills and gifts the rest of team brings. Persistence through adversity – working with a lot of sales people, I have come to appreciate just how difficult a trait this is even among seasoned sales people. Regardless of what approach is taken towards sales, finding out that not everyone wants your solution and turning to the next person to see if it works for them is a trait that deserves celebrating. Seeing both the forest and the trees – a wonderful thing happens when an employee can see the big picture and the role they have in it. It is up to the leader to communicate how this works, but the ability and willingness to understand is worthy of great appreciation. This is another great post because it issues a challenge and paints a picture at the same time. It is one thing to say to someone they should appreciate their staff, it is another to say here are some examples of who is on your team and why you should value them. For me, I think appreciation has to be a regular discipline and an intentional reminder. Especially when you consider people who fall into category #4 (Mr. and Ms. Dependable). Surely everyone is worthy of praise and “kudos” for their contribution. But I know how often those who are the consistent role players that deliver without much flare or fanfare are overlooked until they are absent (either temporarily or permanently). All in all, no one wants to be fully engaged in a place where they are not regularly appreciated. And let me add that it is probably best to not appreciate at all, then to be fake, cheesy or predictable. Be authentic and ask someone to help you if you need some new ideas. Just like you put thought into your business strategy, put thought into your celebration strategy! Thanks Joshua. You underscored so well to give sincere* appreciation to Mr. & MS. Dependable. Often overlooked for sure. And I love the idea of a celebration strategy! Definitely a “worthy” idea. So pleased that you visited and contributed on this today. Great post, it’s a key to retaining employees, in getting them engaged and keeping them that way. The best thing about it…an attitude of gratitude (or engagement) is contagious. Kate, thank you for a laser-focused beacon of sharp guidance. We often here the generic “show gratitude to improve engagement.” But show gratitude to who? For what exactly? Thanking to everyone for everything devalues the power of gratitude. Focusing it on the right behaviors and attitudes amplifies the gratitude exponentially. Totally Agree. That is why we created Kudos. Kudos makes it is easy to recognize people for the great things they do every day and help align the team and the organizations goals and objectives. It all starts with simple Thank You and grows with improved communication and collaboration. Strategic recognition that is meaningful and timely is the key. Check out Kudos at http://www.KudosNow.com . Kudos to Kate for a great post. Applause to you, Kate for this post! Many times we take for granted that people give their best and share personal skills with the rest but it’s getting harder to find that in a person, at least naturally, so when the leader claps one, not only recognize him, but wake up the positive spirit and desire to improve in others to be recognized. I think it’s important to recognize all the small achievements and contributions of people and as leaders we must be much more aware of this process. On the other hand I think if all we did, not only with employees but with everyone around us, that he was in a good mood and yielded you the pass, the smile of one who served your coffee, the son who came out to hug you when you get home from work, the friend who support you when you had a problem, etc., this world would be very different in every way.